The German army began to plan its overt growth to a decisive capability in 1932, and an accelerating implementation and indeed augmentation of this plan followed the Nazis’ rise to power in the following year. Plans had already been laid for the development of a tank force based on existing prototypes, but the recommendations of men such as Oberst Heinz Guderian for a massive force of comparatively light armour used in the Blitzkrieg concept of fast-moving operations found favour with the army’s political masters, who saw both military and propaganda value in a multitude of smaller vehicles that could be obtained for the same financial and industrial outlay as a considerably smaller number of heavier vehicles. In 1933, therefore, the German army started to plan a family of tactically interrelated armoured fighting vehicles for development over the next few years. However, the need to train large numbers of tank crews and support personnel, and also to develop the appropriate tactical doctrines through practical training, coincided with political demands that Germany must be seen to be developing a tank force. The result was a requirement for a nominal 5-tonne light tank with a crew of two and turret carrying two 7.92-mm (0.312-in) MG13 machine-guns. Designs were ordered from Daimler-Benz, Henschel, Krupp, MAN and Rheinmetall for a light tank weighing between 4000 and 7000 kg (8,818 and 15,432 lb), the Krupp LKA I design (with features of the Carden-Loyd Mk VI tankette in its running gear being accepted) and construction by Henschel of three LaS prototypes beginning in December 1933. The first mild steel prototype was running by February 1934, and after successful prototype trials an initial production contract for 150 vehicles was placed in July 1934, later contracts raising the total to about 1,800. Of this number about 300 were of the initial PzKpfw I Ausf A (SdKfz 101) model with four road wheels and the remainder of the more powerfully engined PzKpfw I Ausf B (SdKfz 101) variant with five road wheels. The Ausf A was powered by a 60-hp (44.75-kW) Krupp M 305 engine for a speed of 37 km/h (23 mph), while the 0.43-m (1.4-ft) longer Ausf B had the 100-hp (74.6-kW) Maybach NL 38 TR engine for a speed of 40 k/h (24.9 mph). The PzKpfw I was the main vehicle used by the German tank force up to the beginning of World War II in 1939, and was largely instrumental for the high quality of German tank tactics, maintenance and overall capability at the beginning of that war. The type was also used operationally in the Spanish Civil War (1936/1939), achieving much but also confirming the tactical limitations imposed by a two-man crew and armament of only a pair of machine-guns. The armour varied from 7 to 13 mm (0.28 to 0.51 in) in thickness, and this too was confirmed as too thin for genuine operational capability. Variants of the PzKpfw I included the SdKfz 265 three-man command vehicle with thicker frontal armour, a fixed turret and only one machine-gun; an explosive demolition vehicle; a flamethrower vehicle; and most interestingly of all the VK601 prototype for the proposed PzKpfw I Ausf C reconnaissance and airborne variant with armour increased to minimum and maximum thicknesses of 10 and 30 mm (0.39 and 1.18 in), a revised turret accommodating one 20-mm cannon and one 7.92-mm (0.312-in) co-axial machine-gun, a 150-hp (112-kW) engine, and a running gear arrangement based on five large-diameter interleaved road wheels for a speed of 65 km/h (40.4 mph). Nothing came of this project, and as the total obsolescence of the design led to the PzKpfw I’s retirement from front-line roles from 1941, some chassis were then converted to other roles. In general, however, the small size and light weight of the chassis made it difficult to install heavier armament even on exposed limited-traverse mountings. In 1934 it became clear that the German army’s definitive PzKpfw III battle and PzKpfw IV medium tanks would take longer to develop than anticipated, and it was decided to produce another interim type to succeed the PzKpfw I and offer superior operational qualities though an increase in crew to three and nominal weight to 10 tonnes. Designs and prototypes were tendered by Henschel, Krupp and MAN, that eventually selected for development as the LaS 100 being the MAN design with a 130-hp (96.9-kW) engine to provide a maximum speed of 40 km/h (24.9 mph) with armour to a maximum thickness of 14.5 mm (0.57 in) and a turret-mounted armament of one 20-mm KwK 30 cannon and one 7.92-mm (0.312-in) MG13 co-axial machine-gun. Basically similar prototype series were produced as the LaS 100 a1 and LaS 100 a2 (25 vehicles each, alternatively designated PzKpfw II Ausf a1 and PzKpfw II Ausf a2) with six road wheels on each side in paired bogies with an equalizing beam, before the arrival in 1936 of the pre-production LaS 100 a3 (PzKpfw II Ausf a3) and improved PzKpfw II Ausf b with 30-mm (1.18-in) armour and a 140-hp (104-kW) Maybach HL 62 TR engine. Extensive trials were continued in this period, together with operational trials in the Spanish Civil War, and this resulted in the 1937 arrival of the PzKpfw II Ausf C with a full-width superstructure, a revised turret and completely remodelled suspension based on five larger-diameter road wheels with independent elliptical springing. This led to the first service model, the 7305-kg (16,104-lb) PzKpfw II Ausf A (SdKfz 121) with improved protective features but otherwise similar to the Ausf C. The PzKpfw II Ausf B introduced a slightly more powerful engine and revised tracks, while the PzKpfw II Ausf C was very similar but had thicker frontal armour for a weight of 9500 kg (20,944 lb). Full-scale deliveries began in 1937, and such was the pace of production that 1,000 PzKpfw II tanks were available for the Polish campaign that started World War II. The type was clearly as good as any light tank in the world in the late 1930s, but by the beginning of the 1940s the position was changing: thus when the PzKpfw II was used in the Western campaigns of May and June 1940, it proved to possess an admirable reconnaissance capability but also to be a liability when it was forced to fight: even the frontal armour was too thin to stop the British 2-pdr (40-mm) shot, and the KwK 30 cannon projectile could not penetrate the armour of British and French medium tanks. Development of the basic machine was still continuing, however, and in 1939 Daimler-Benz produced the PzKpfw II Ausf D and PzKpfw II Ausf E variants with revised running gear: this was on the Christie pattern, with four large road wheels using torsion bar rather than vertical springing, and allowed an increase in maximum speed to 55 km/h (34.2 mph) under good conditions. But cross-country performance was inferior to that of the Ausf A to Ausf C variants, and in 1940 most surviving vehicles were taken in hand for conversion to other roles: 95 became Flammpanzer II (SdKfz 122) flamethrower tanks, and the rest were used for self-propelled artillery chassis. 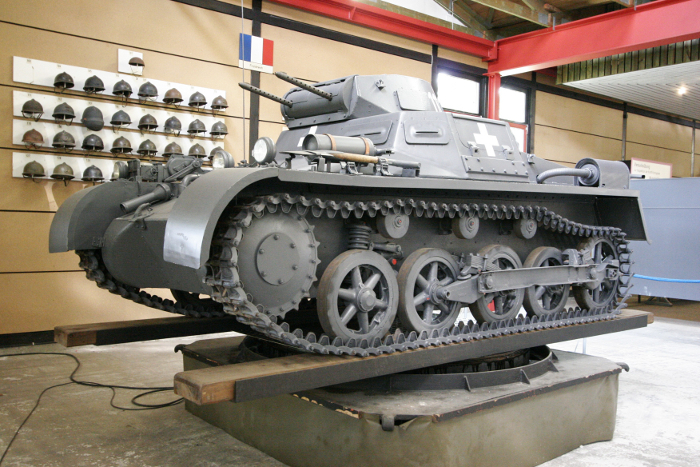 The main stream of development therefore evolved from the Ausf C, resulting in the 1940 introduction of the PzKpfw III Ausf F with solid conical-hubbed rear idlers in place of the previous open spoked type and frontal armour increased to a maximum of 35 mm (1.38 in) by the addition of spaced appliqué plates to defeat the hollow-charge anti-tank warhead that was becoming increasing lethal to battlefield tanks. Further evolution of the same basic theme resulted in the PzKpfw II Ausf G and PzKpfw II Ausf J variants with a stowage box on the turret bustle and other detail modifications. Production of the PzKpfw II series continued into 1941, but in that year the start of the war against the USSR displayed beyond doubt that the type was obsolete. A planned development with a 300-hp (224-kW) Maybach HL-P engine for a speed of 65 km/h (40.4 mph), 30 mm (1.18 in) of armour and the higher-velocity KwK 38 20-mm cannon was therefore cancelled, and from 1942 the PzKpfw II disappeared from front-line service in its original role. Surplus chassis were extensively reworked for other roles. The final development of the basic vehicle was the PzKpfw II Ausf L Luchs (lynx), developed as the SdKfz 123 fast reconnaissance machine. This was derived from the VK1303 experimental model, itself produced after experience with the heavily-protected VK1601, upgunned VK1602 and high-speed VK901 prototypes. The Ausf L used the Christie-type running gear of the Ausf D, spaced armour, a 180-hp (134-kW) engine for a speed of 60 km/h (37.3 mph) and a main armament of one KwK 38 20-mm cannon in the first 100 examples, and one KwK 39 50-mm gun in the last 31 examples. With hindsight it is easy to criticise the PzKpfw I and PzKpfw II as inadequate for their roles in World War II. But this omits the fact that the two were developed as interim types and were never intended for full-blown war operations, being forced into them only by the limitations of the German production system that failed to deliver adequate numbers of the PzKpfw III battle tank and PzKpfw IV medium tank in time for a war that was originally planned to begin in 1942 but then brought back to 1939 by Hitler’s ambitions. When one makes allowances for this factor, the PzKpfw I and PzKpfw II emerge in a truer light as the important machines they were in the development of the German armoured force. By 1935 the German designers and industrialists had gained sufficient experience with the PzKpfw I and PzKpfw II light tanks to embark with a realistic hope of success upon the first of Germany’s definitive battle tanks, the five-man PzKpfw III with a nominal weight of 15 tonnes. The German army’s plan at this time was to field a force based on two main types, one a battle tank with a high-velocity anti-tank gun backed by machine-guns, and the other a medium tank with a medium-velocity gun backed by machine-guns and intended mainly for the support role: the battle tank became the PzKpfw III with a 37- and later a 50-mm gun, while the medium tank became the PzKpfw IV with a 75-mm (2.95-in) gun. The standard tank battalion had four companies, and it was planned that three of these would field the PzKpfw III battle tank and one the PzKpfw IV medium tank.